“Wagara” are traditional Japanese patterns. They are historic designs, each with a specific meaning, originally created for decorating traditional Japanese garments – kimono and yakata. The patterns that date back to the 8th century Heian period of Japan, are largely inspired by nature and were crafted using techniques from painting and Chinese calligraphy. They were worn with purpose for different seasons and occasions. However, in the last century this language of pattern was being lost as younger generations shed traditional dress for more globalised garb. 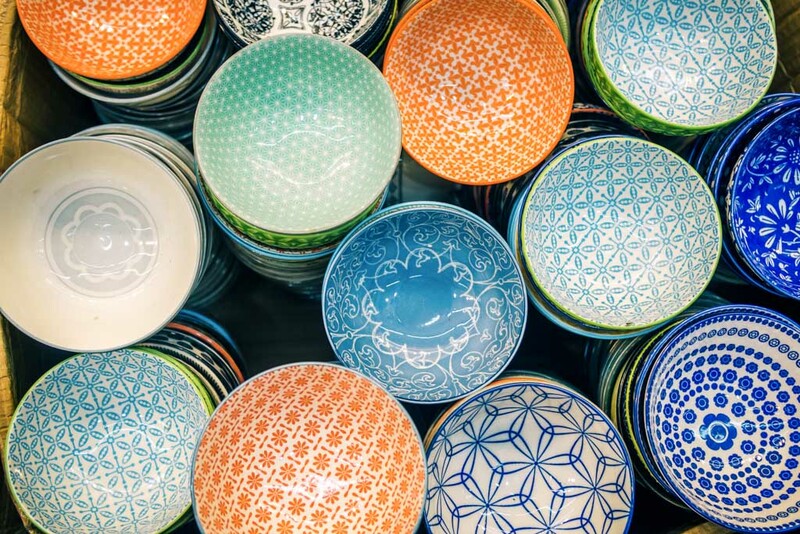 This spurred the use of wagara in homewares and fashion accessories in an effort to prolong the dialect of these traditional Japanese patterns. Though new wagara have continued to emerge throughout history, there are several traditional designs. Seigaiha (青海波) translates to “blue ocean waves” and is a geometric design representing water. It is formed using overlapping concentric circles to form a series of arches or scales. The pattern was historically used to depict the sea on Chinese maps. Versions of this pattern also appeared in other ancient civilisations such as Egypt and Persia. In Japan, the pattern symbolizes peace and good luck. Tatewaku (立涌) is a sinuous design of vertical waves that resembles the rising of steam, thought to be auspicious. The pattern was likely adapted from similar Chinese designs and has also been compared to mist rising off waterways in the spring. The meaning of Tatewaku is therefore “rising above” circumstances. During its infancy in the Heian period, the design required advanced techniques to create and therefore was only worn by those who could afford it. There are many variations of the design where different motifs are placed within the hourglass forms of the parallel waves. Popular combinations include clouds (kumotatewaku 雲立涌) and chrysanthemum (kikutatewaku 菊立涌). Kikkou (亀甲) is a tortoise shell design that represents intellect, and longevity. Kagome (籠目) is a hexagonal design inspired by a traditional basket weave. The pattern is thought to ward off evil. Hishi (菱) is the abbreviation of hishimon and is a diamond design that symbolizes prosperity. The pattern is inspired by the leaves of the water chestnut, an aquatic plant that exhibits high productivity. The design can be seen in many different variations including construction where roof beams or lattice cross to form the repeating diamond shapes. San Kuzushi (三崩し) or Sannojikuzushi (三の字崩) is a crosshatch pattern made up of alternating horizontal and vertical sets of three lines. These lines come from the character 三 san. 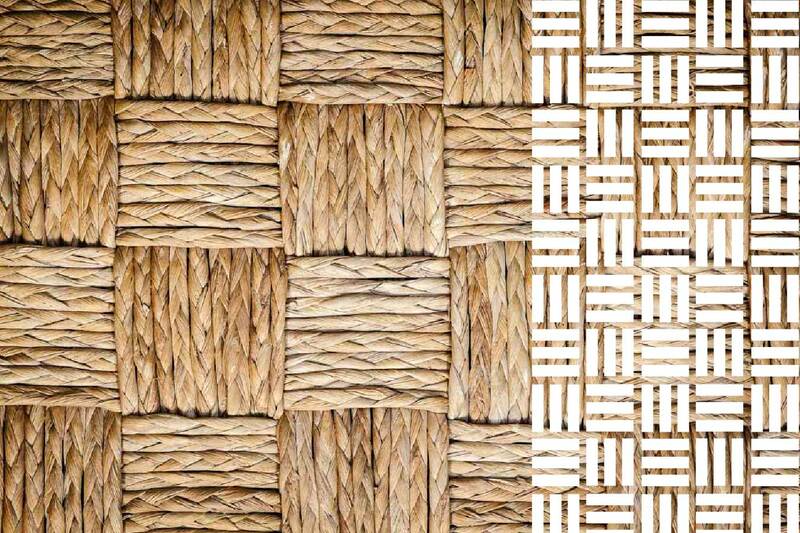 The design is another basket weave derivation and is commonly used in architecture. Shima (縞) simply means “stripe.” A variation of the pattern is Yoshiwara Shima, vertical stripes or chains formed by interlinking diamonds. Yoshiwara is the name of the Tokyo red-light district during the Edo Period (early 17th century). Back then the chains were probably more symbolic of the life of a courtesan in Yoshiwara rather than their wealthy clients who wore the design. Now the chains are thought to represent the links of a community and the pattern is good luck. Uroko (鱗) meaning “scales”, is a pattern of alternating dark and light triangles. The scales are thought to have a protective quality when symbolizing a dragon on a kimono or obi. The design is also used in theatre to represent a snake in the costumes of villains. Ichimatu (市松) is a simple check or plaid design named after an 18th century kabuki actor who wore the pattern. Since these traditional designs emerged, many more have followed. Today, designers will blend modern motifs with traditional patterns to create new wagara. Here are some other commonly seen patterns that appeared over time. Asanoha represents a hemp leaf with six diamonds radiating from a common centre point. Hemp is fast growing and durable, therefore the pattern is commonly used in young children’s clothes with hopes that they grow strong and healthy. Yagasuri or Yabane is an arrow design that is strongly associated with the Japanese saying that an arrow fired, never returns. The pattern is often worn at weddings as a symbol of good luck and at graduations to represent unwavering determination. Arrow-shaped charms are sold at shrines around New Year to repel bad fortune. Yagasuri or Yabane is an arrow design that is strongly associated with the Japanese saying that an arrow fired, never returns. The pattern is often worn at weddings as a symbol of good luck and at graduations to represent steadfast determination. Arrows are sold as good luck charms named Hamaya (translates as “demon-breaking arrow”) around shrines during New Year. How would you use these traditional Japanese patterns? Let us know in the comments below. For more cultural and design inspiration from Japan, see Kawara: Decoding Roof Tiles of Japan and Textures of Tokyo.